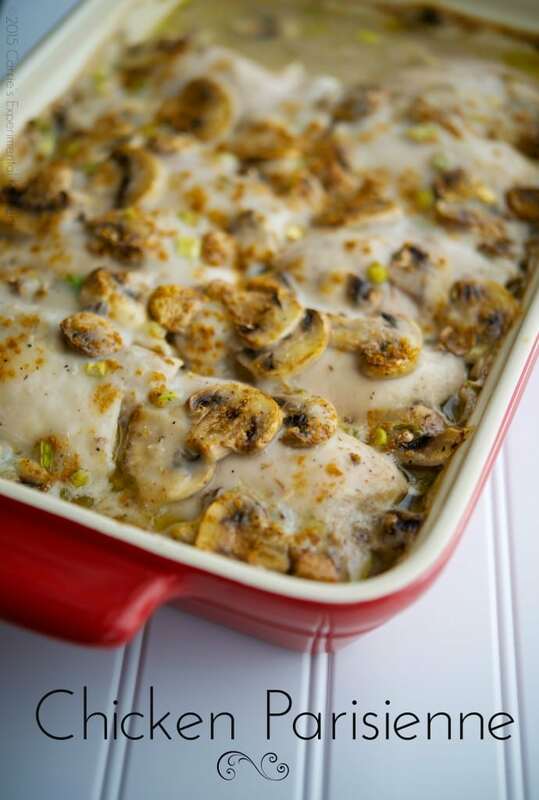 Chicken thighs cooked with fat free cream of mushroom soup, white wine, fresh mushrooms, scallions and Greek yogurt. Hezzi-D’s Books and Cooks is hosting a Retro Food Event so I whipped out the 1968 version of the Better Homes and Gardens Cookbook to get some retro food inspiration and decided to experiment with my own version of the classic dish, Chicken Parisienne. Chicken Parisienne was popular back in the late 1960’s and early 1970’s as it was a really simple dish to make and was one of the more popular “canned soup” recipes of that time. I remember eating something like this as a child, but since I was born in 1968, I don’t completely remember if this was the exact same way my Mom used to make it or not, but this was delicious! The original recipe calls for chicken (I’ve seen recipes for both boneless and bone-in), cream of mushroom soup, white wine and sour cream, but I changed it up just a bit. My version of Chicken Parisienne uses skinless, bone-in chicken thighs, fat free cream of mushroom soup, white wine, fresh mushrooms and scallions, and Greek yogurt; then I sprinkled a little paprika on top to give it a little color. Prep time on this dish is next to nothing too. Simply place your chicken in a casserole dish, combine all of the ingredients in a bowl, mix well and pour over the chicken; then bake until the chicken is cooked through and the sauce is bubbling; approximately 1 hour. Though I didn’t cook this in my slow cooker, I bet you could add all of the ingredients to the cooker and cook on low 6-8 hours or high 4-6 hours, but I would leave out the yogurt and add at the end before serving. My family really liked this recipe for Chicken Parisienne and it makes enough sauce to pour over some rice or egg noodles as well. This recipe makes enough to serve 6-8 people; however, it freezes beautifully so go ahead and save some for another meal. ~Enjoy! 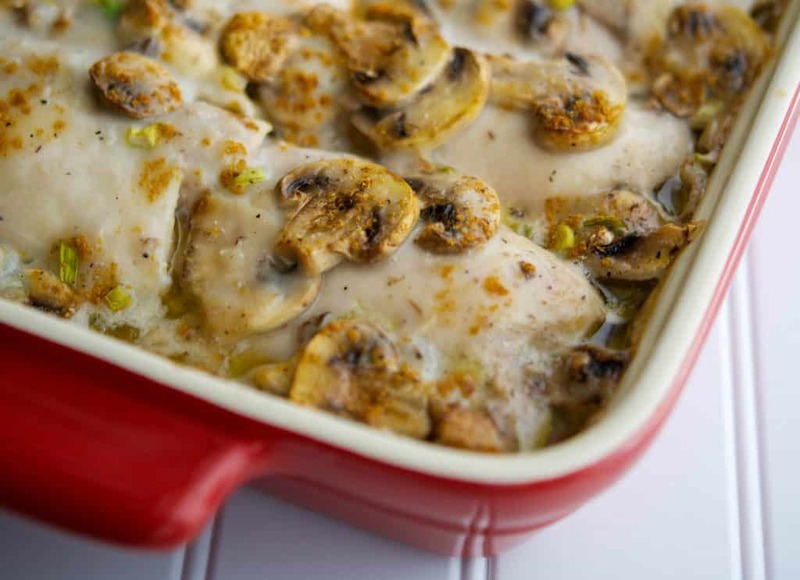 Place the chicken in an oven safe casserole dish. 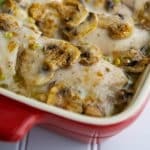 Combine the wine, soup, mushrooms, scallions and yogurt in a bowl, mix well and pour evenly over the chicken. Season with salt and pepper as desired. Sprinkle the top with paprika, place in the oven uncovered and bake for 1 hour until chicken is cooked through and sauce is bubbling. Don’t forget to check out these other retro recipes too! What is your favorite Retro Food recipe? I’m pretty sure I’ve had a version of this but didn’t know it was called Chicken Parisenne. I think my parents or their friends would just call it creamy chicken. When I saw the title I wasn’t sure what this is, but now I know it. Chicken in mushroom sauce. It looks delish! I love dump and bake recipes. And great idea on the crock pot option too! Can’t wait to try this one. Thanks Diana and yes, they certainly make weeknight meal planning a breeze! Any dish with chicken and mushrooms is fine by me! What a delicious retro entree, Carrie! I got this cookbook as a wedding gift in 1974 and Chicken Parisienne was a regular meal in our house when the kids were growing up. Thanks for the great memory. Thanks for stopping by Wendy. Food certainly has a way of being nostalgic! This looks like such a perfect comfort food meal and so simple to put together. Thanks for stopping by Laura, it really was. Perfect for a busy weeknight. I love cooking with wine and your recipe looks so easy and delicious! So do I Sue! Thanks for stopping by. This looks so good. A testament that some retro dishes are worth repeating. Absolutely! Thanks for stopping by Marlene. This sounds like a perfect comfort dish! I love all of the updates you did it too…. Thanks Mary Ellen, I try to lighten things up where I can. I never heard this term before, now I see it, I know. Sounds like good comfort food! Love retro dishes – they are so good for bringing back memories. But not so good on the hips so love what you have done to lighten this one up. 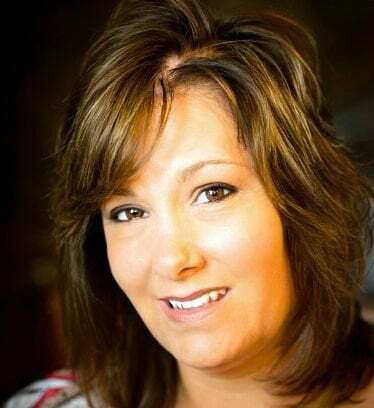 Thanks Caroline, I try to lighten up recipes where I can without sacrificing flavor. Thanks for stopping by! I love the touch of nonfat Greek yogurt in this! Did it call for sour cream originally? I usually use the yogurt instead of sour cream also. Beautiful dish and I think my girls would love this! Yes Valerie, it called for regular cream of mushroom soup and sour cream. I love when you can lighten something up a bit to make it a little healthier. Thanks for stopping by! I had never heard of this before, but it looks absolutely delicious!! This looks like a perfect weeknight meal! I’m loving all these casserole recipes–but I can’t make up my mind which one to try first! Thanks Anne, we really enjoyed it! I actually did not grow up eating this dish, but it sounds very similar to casseroles my mom did make. I love your lightened up version! Such an easy casserole – no complaints here. This looks amazing. Quick question. Do you cook this covered or uncovered? Thx! And keep up the good work! Hi Tom, This chicken dish is cooked uncovered. I hope you like it and thanks so much for stopping by! Have a great week. Back in the 1960’s and 1970’s my culinary creative father used to make this at least once every couple of weeks, and I remember my two younger sisters and I never tired of it! Of course, he used sour cream, as he was certainly NOT a low-fat cook, but your recipe is at least as good as my dad’s. I followed the recipe exactly and it was just as delicious as I remember it. It brought back lots of good memories of family gathered round the dining room table and enjoying the food, and I love it when a meal does that! Thanks for posting this…it really deserves to become a household staple dining experience again! I love when food can bring back happy memories and many times it does for me as well. I’m so glad this recipe lived up to your expectations and that you enjoyed it. Thank you so much for your kind words! HI! I would LOVE to take this to a potluck dinner, but what could I use instead of wine? Chicken broth would work fine too. Enjoy Shirley!